As his twenty year high school reunion approaches, Calvin “The Golden Jet” Joyner (Kevin Hart) regrets his current life. Despite being married to his high school sweetheart, he is stuck in a low level accounting position, and feels like he peaked in his school days. When he unexpectedly runs into former dorkish fat kid, Bob Weirdicht (Dwayne Johnson), he finds that Bob is a transformed man. Now calling himself Bob Stone, he claims to be a secret agent. Soon Calvin finds himself embroiled in an international game of espionage, on the run from the CIA, and trying to work out what is exactly wrong with Bob. This is a film buoyed by the chemistry of its principals. Johnson and Hart together cover a myriad of mistakes made by Central Intelligence, by the sheer combined force of their charisma. It doesn’t matter that the camera is too close making some of the fight chorography muddled, or the small scale of some of the action sequences gives the film a cheap feel. When those two are cracking wise together, everything else is washed away. Hart is comparatively low key here, pairing his usual high energy antics back a peg or two. The result on screen benefits from this, and his straight man dreaming of faded glories and dragged into a situation beyond his control is constantly amusing. However it is Johnson’s strange, off-centre and manically enthusiastic Stone that is the bedrock this film is founded on. From the very first moment this mountain of muscle bulges out of his unicorn tee shirt, The Rock commits to his strange and wacky role a hundred percent. Playing mostly against type, Johnson produces some comedic gold, combining the skill set of a typical over the top action hero with the personality of an over enthusiastic geek. It is a weirdly captivating performance that he is obviously having a lot of fun with, and that is infectious. 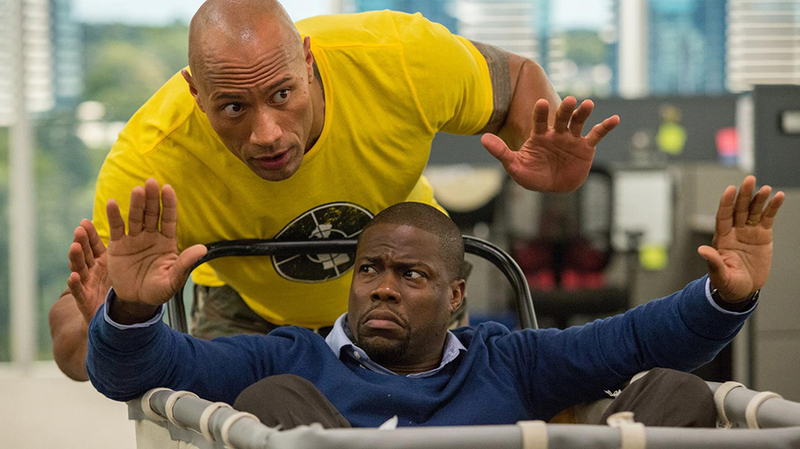 The shame is, with just a bit more attention to the action scenes, and a lot more attention paid to the script, Central Intelligence really could have been a first rate action comedy. These are characters that really connect with audiences, thanks to Johnson and Hart’s performance. As it stands, there is little beyond the chemistry of its two leads to recommend it, but that alone makes it worthy of at least a watch.